This is my adaptation of one of those Pampered Chef recipes you get when you host a party. It's pretty tasty, and my version is healthier than the original! Spread refried beans over bottom of a 9 inch glass pie plate (or other similarly sized baking dish). In a bowl, combine cream cheese, sour cream, and taco seasoning. Finely chop garlic. Add to bow and mix well. Spread cream cheese mixture evenly over beans. Grate cheese over top. To prepare toppings, dice tomato and thinly slice onions. Thinly slice cilantro. 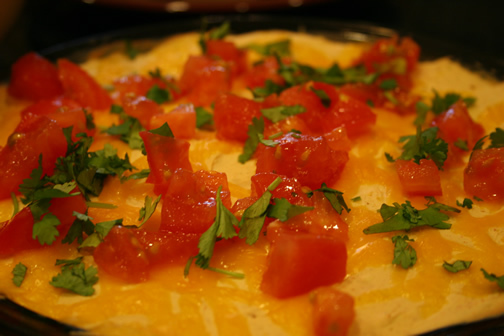 Sprinkle tomatoes, onions, and cilantro over dip. Garnish with additional sour cream, if desired. Serve with tortilla chips.